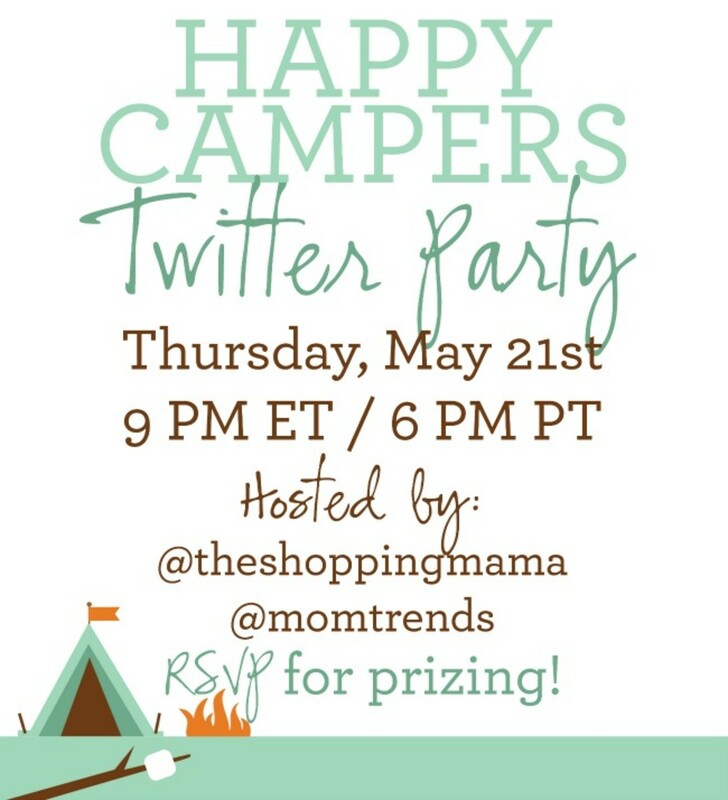 To celebrate the launch of Happy Campers, Guide to the Great Outdoors, we are excited to host a Twitter Party tomorrow night. Join us to chat all things outdoors, including how to make the most of the summer with kids. At the party we&apos;ll be tweeting our top tips for stayactions, vacations and summer camp. We can&apos;t wait to hear your ideas, too! Make sure you RSVP and join the conversation on Twitter for your chance to win some amazing prizes. “Boo-Boos Happen” first aid kit from Topricin. Valued at $19.99. The Boo Boos Happen first aid kit is a must-have for Moms and includes: a tube of Topricin for Children and ‘Ouchies’ self adhesive bandages that kids can decorate themselves, creating a design with the markers that are included. The handy zippered blue bag is perfect for tucking in other essentials and is recyclable. Trimino: 2-bottle case of trimino protein-infused water, containing all four delicious flavors. Trimino, is an alternative to high calorie beverages, it’s a healthy and delicious low-calorie functional water for women. It contains seven grams of high quality whey protein and 100 percent of the Recommended Daily Allowance (RDA) of vitamin B complex. At only 28 calories per 16-oz. bottle, it’s light and refreshing with no sugar, carbohydrates, caffeine, gluten, or lactose. 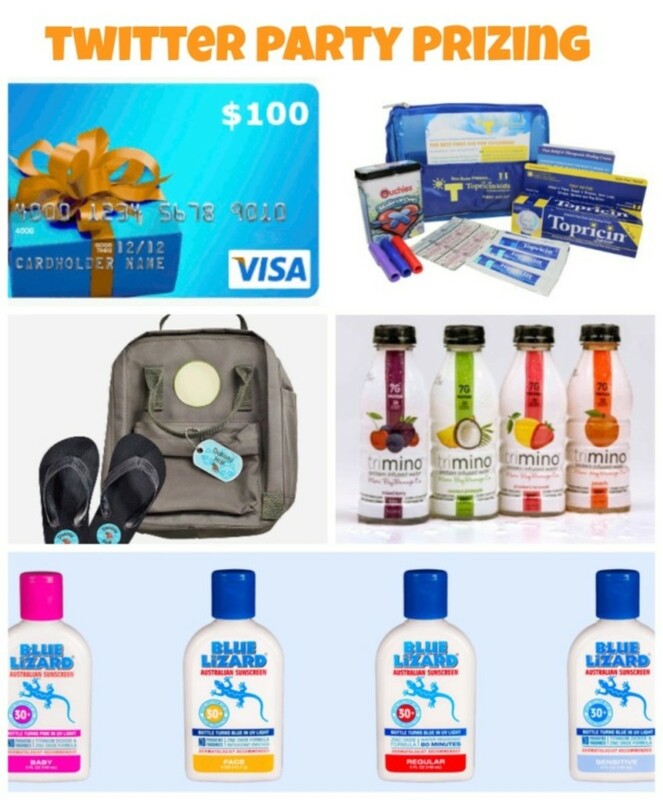 Blue Lizard sunscreen was originally created in Australia, where sunscreen standards are the strictest in the world. This is pharmaceutical-grade sunscreen made with the highest quality ingredients. They list every ingredient (and tell consumers why it’s used) and providing the best resources to help consumers understand what makes an effective sunscreen. Blue Lizard’s patented PBA-free Smart Bottle™ changes color from white to blue (or pink for Baby formula) when it is exposed to harmful UV rays reminding you to put on sunscreen. Prize packs each include: 1- 5oz Sensitive, 1- 5oz Face, 1- 3oz Sport, 2- Baby Sachets and 1- Color-change Bracelet. Mabel’s Labels Camp Combo Package. This camp label pack is packed with a collection of UV resistant, waterproof labels and personalized tags designed especially for everything that goes to summer camp. Identify clothes and footwear, toiletries, swim gear, backpacks and more with these summer essentials. Includes: 10 Personalized Name Stickers: 70mm x 16mm (2-3/4″ x 5/8″), 24 Mini Custom Name Stickers: 38mm x 8mm (1-1/2″ x 5/16″), 8 Custom Shoe Stickers: 33mm (1.3″), 50 Tag Mates™ Stick On Clothing Labels: 21mm x 10mm (13/16″ x 3/8″), 2 Personalized Bag Tags: 57mm x 32mm (2-1/4″ x 1-1/4″). Bonus! Get a set of five fun postcards so your child can keep in touch the old fashioned way.